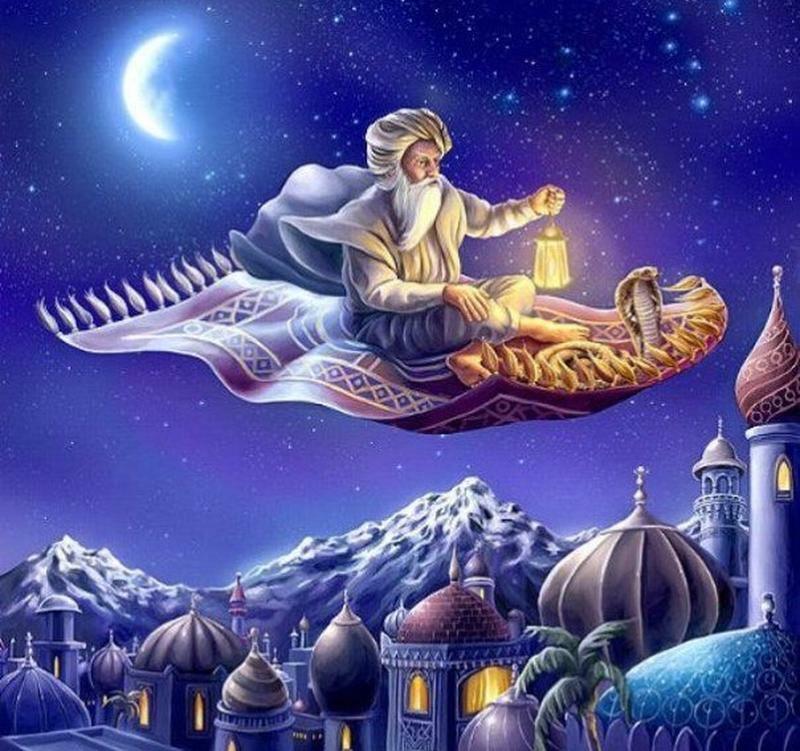 One of the most enchanting aspects to come out of ancient Arabian tales is mentions of magic flying carpets. Thanks to Disney’s hit animated movie, Aladdin, we are all familiar with magic carpets and their ability to fly silently all over the city while the two main characters sing a song and fall in love. 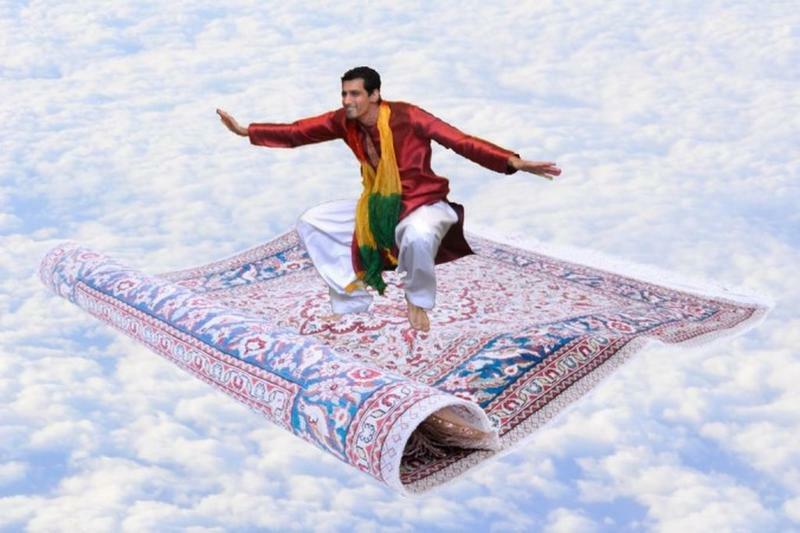 Flying carpets are not, however, a Disney invention. The magic carpet in that movie was based on actual stories of levitating rugs from ancient Arabian texts. Let’s look at the real history behind these wondrous magic carpets. Legends of the flying textile were an important part of the collection of Middle Eastern folktales that have come to be known as the One Thousand and One Arabian Nights. This collection was amassed over centuries and includes stories from ancient Arabia, North Africa, Turkey, Greece, Persia, India, and even Jewish tales. 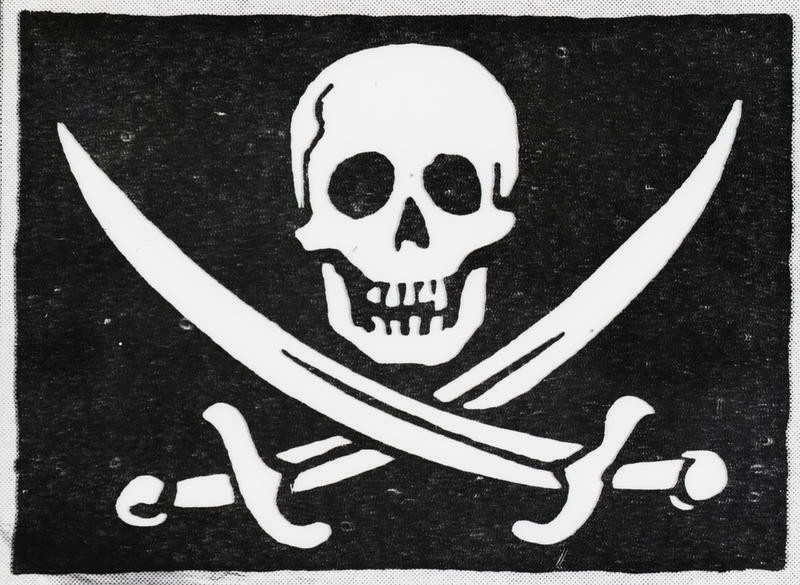 The various folk tales were woven together using a framing device to merge them. 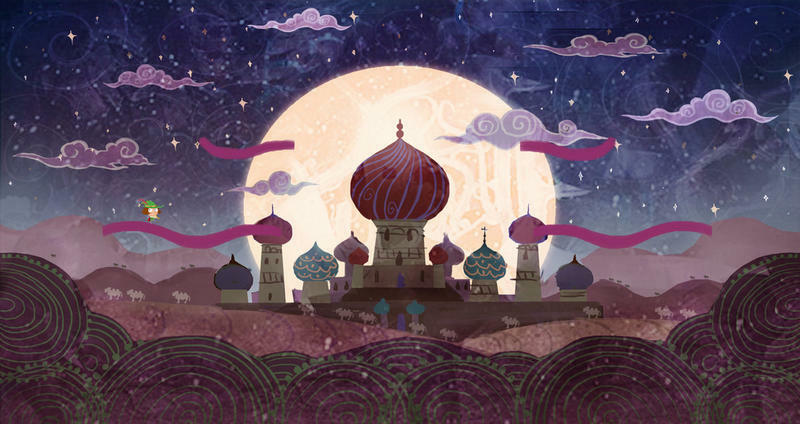 In One Thousand and One Nights, the framing device is that the stories are all told to a powerful ruler named Shahryar by his clever bride, Scheherazade. The ruler, Shahryar, was in the habit of marrying a pretty, young virgin and then murdering her the next morning. When it was Scheherazade’s turn, she had a plan. On their wedding night, Scheherazade told her new husband an exciting tale, but she ended just when the story was getting exciting. The husband begged for more but Scheherazade simply told him that she would continue the story the next time, thus postponing her execution. She kept this up…ended her nightly stories with a cliff-hanger…for one thousand and one nights. 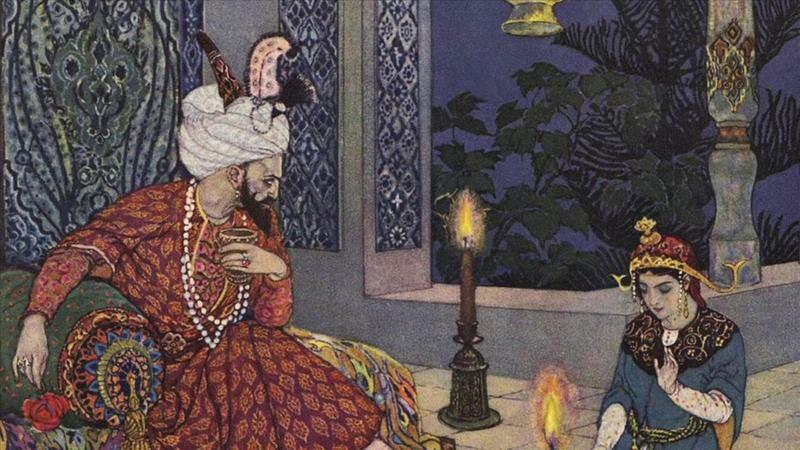 In the end, Shahryar was too in love with Scheherazade to kill her. 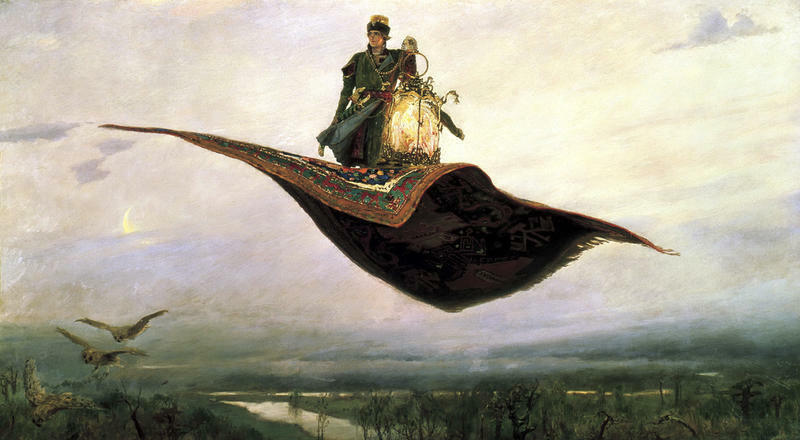 During her tales, Scheherazade mentioned the wonders of magic flying carpets. 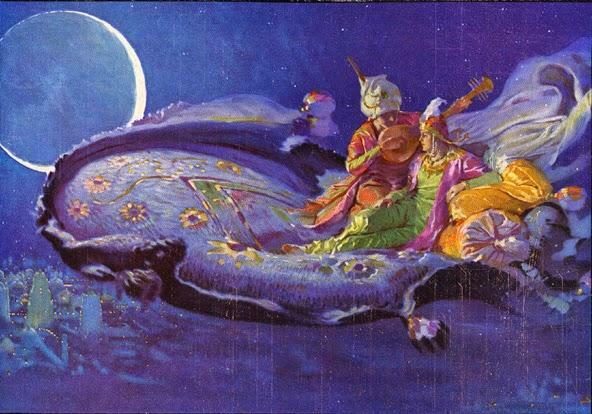 The flying carpet was a way for the hero of the story, or the villain, to travel quickly and quietly from one place to another without being seen or heard. According to researchers, these legends about flying carpets date back as far as the ninth century. 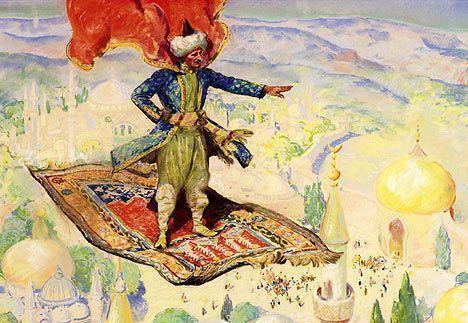 Some evidence seems to indicate that the very first flying carpet stories came out of Persia. 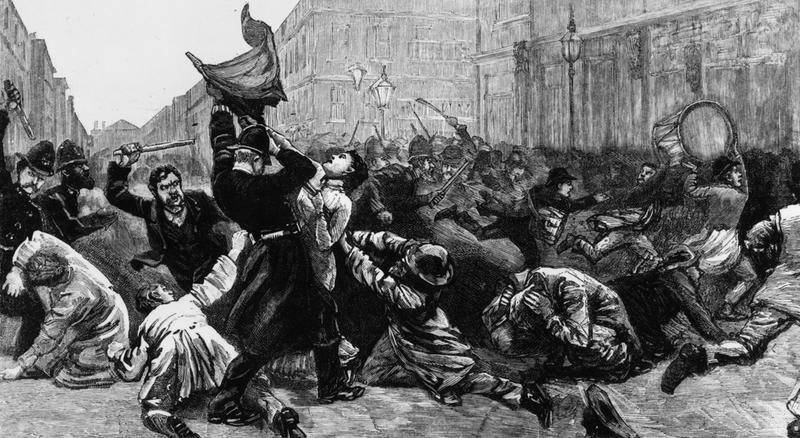 These stories may date back much further than the ninth century. In antiquity, and even now, Persia is renowned for their textile production. Handmade Persian rugs are still a highly prized and extravagantly expensive luxury item. Were Flying Carpets Used as Weapons? In one flying carpet story from the 2nd Century, BC, a Parthian king by the name of Phraates II was engaged in a war with the ruler of another kingdom, Antiochus VII of Seleucid. During one battle, Phraates traveled on a flying carpet that flew as high in the air as the Zagros Mountains. 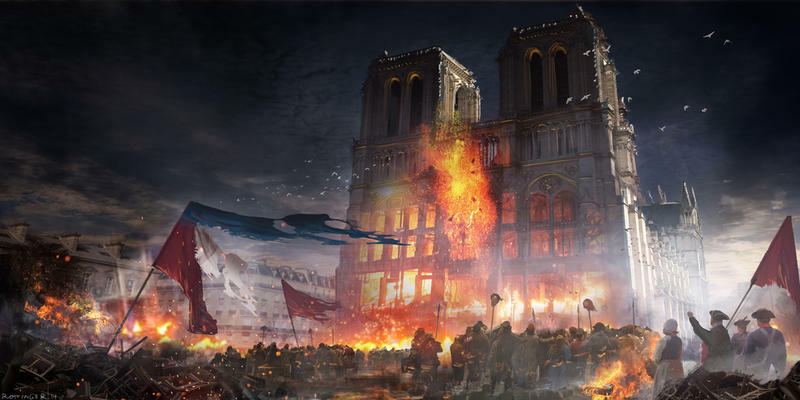 From his lofty height, he rained down fire onto Antiochus and his army. After he secured his victory, Phraates flew back to his own land and floated on his magic carpet just over the heads of his subjects who were hosting a lavish victory celebration. In a 3rd century AD story, Shapur, ruler of the Sassanian Empire, secured the use of a magic flying carpet. He used it to enter a Roman army camp late one night and flew just high enough that the guards did not see him. 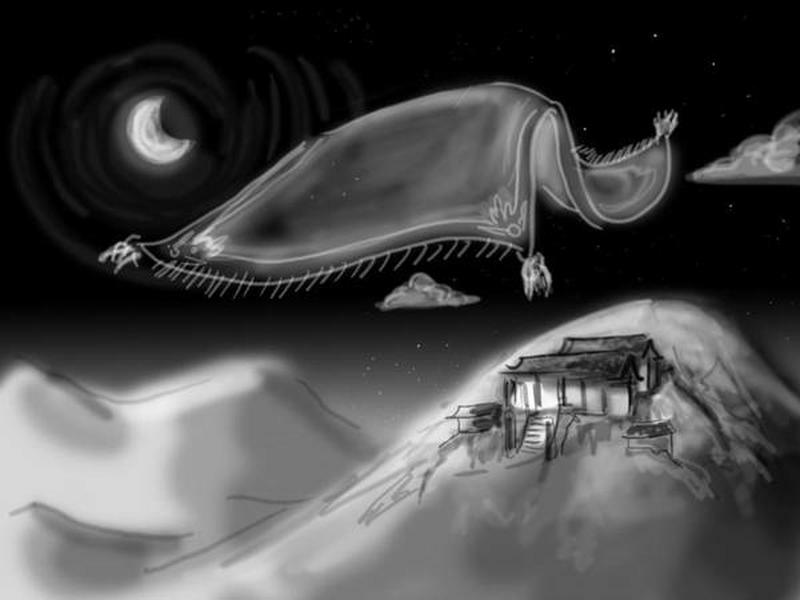 He crept into the tent of the sleeping Emperor Valerian and kidnapped him using the flying carpet as their getaway. Isaac Ben Sherira, a Jewish scholar, wrote about King Solomon and magic flying carpets. Ben Sherira claims he based his scholarly writings on two ancient texts that are long since lost. In his writings, he claims that the Queen of Sheba commissioned a royal alchemist to make a flying carpet for her. He noted that the alchemist had spent years perfecting his craft of weaving flying carpets and that the secret to flight was in the dying process, not the weaving process. The carpet he made for the Queen of Sheba was the biggest and most beautiful of all the carpets he had ever made. It was made with green silk and had silver and gold threads woven into it. It was even embellished with precious gemstones. When the magic carpet was complete, the Queen of Sheba had it sent to her lover, King Solomon. 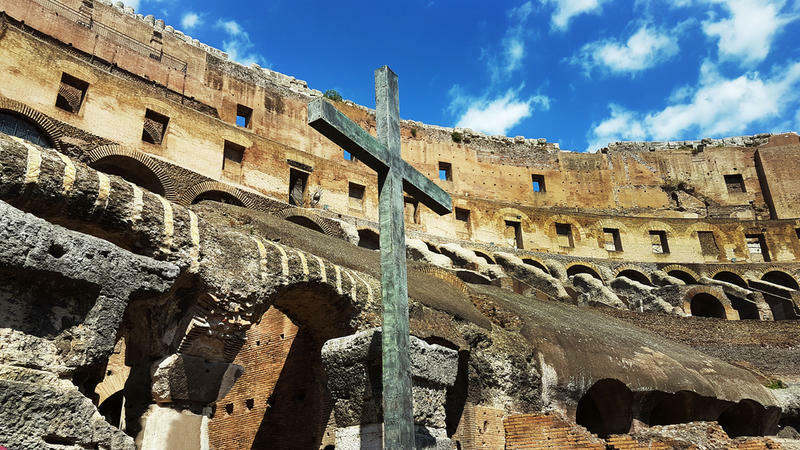 He received it right in the middle of building the great Temple of Jerusalem so he was too busy to stop and admire the gift. He handed it off to a courtier. 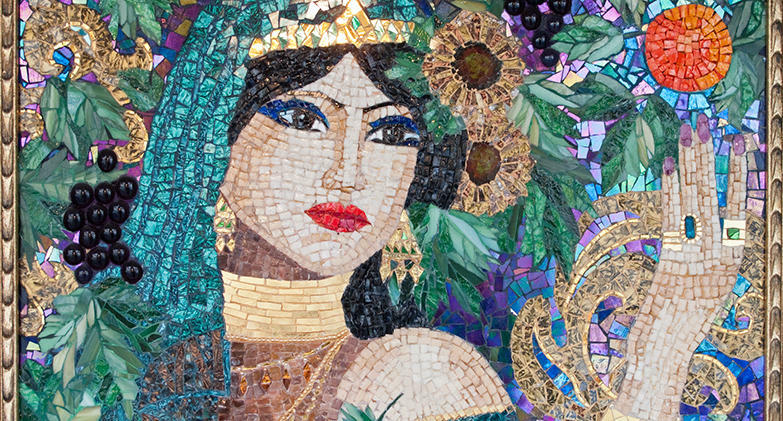 When the Queen of Sheba got word that the King brushed aside her gift, she was heartbroken. She vowed she would never again have a magic carpet made for anyone. Without her royal patronage, the alchemist could not afford to keep making flying carpets. He sent his apprentices away, and when he died, he took the secret of flying carpets with him to the grave. Another version of the story says that God bestowed a magic carpet to King Solomon. The carpet was so large that 40,000 men could fly on it high in the air. King Solomon was proud and boastful about his magic carpet. In fact, he grew so full of pride that God decided King Solomon needed to be knocked down a few pegs. One day, King Solomon had 40,000 of his men flying around on the carpet when God issued his punishment. He shook the carpet, much like how one would shake the dust and dirt off a rug, and send all 40,000 men plummeting to earth. The King was remorseful at the loss of so many of his men that he refrained from flying the carpet again. 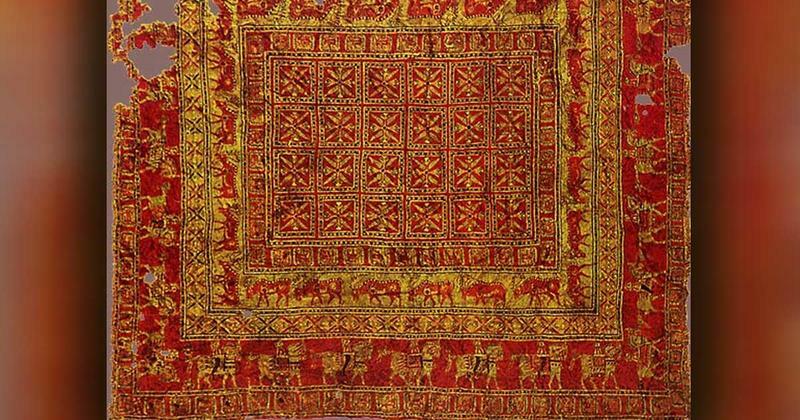 In fact, most of the legends and stories about flying carpets end with a reason why the magical textiles are no longer in use.